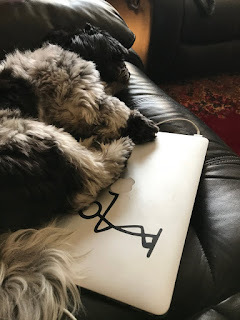 NYC Educator: Blog or Dog? For me, it's not much of a choice. Dog before blog, of course. I'd been dreading this week, because I was scheduled for meetings four nights in a row. Monday was the 400-member Contract Committee. Tuesday School Leadership Team. Tonight is the UFT Delegate Assembly, Thursday is the ELL Focus Group. However, my wife came down with the flu, and is really floored by it. If I don't go home, my noble little dog will suffer. Toby is a survivor of Hurricane Maria in Puerto Rico, and how this little guy pulled that off I have no idea. Monday morning I took him out in the miserable wind and rain, and he decided to Be a Tree. Probably he has bad memories, or maybe even PTSD. I dragged him around a little, but he would not move at all on his own volition. After a few minutes I gave up and brought him back inside. After not having been out since 7 the previous night, he declined food and drink and waited until I got home at 4 PM. I surely would have exploded or something, but he's made of stronger stuff than I.
Tonight is the DA. They're going to talk about the new UFT app. I've actually downloaded it. (Correction--I now realize I'd downloaded another app they offered to promote recruitment.) I followed the directions given me and it simply does not work. I wrote back and it turns out you can't yet follow the directions. You need further directions, which I presume will be given tonight. I hate to miss the DA, not because it's such great fun, but rather because I can usually get two blogs out of it--first the actual notes, and then an analysis. Sometimes it makes people crazy, and part of my role as blogger is to make people crazy. But I can't allow Toby to suffer so I'm giving it up and going home. My New Action buddy Jonathan Halabi has agreed to take notes in my absence, and I will post them here as soon as I get them. I'm glad, though, because I get to walk Toby. Toby is crazy to walk. He will walk anywhere and everywhere, and he doesn't care how long it takes. Walking him has become my Zen, my center, and half the things I write come to me while I'm talking to him. Good walk Toby. No, don't eat that thing. No, we're not visiting that big dog. He might not scare you, but he scares me. Toby is amazingly friendly. He wants to greet every human and every dog we come across. It's good because my tendency is to keep to myself. I now have multiple regulars I see on the Nautical Mile in Freeport, both canine and human. Alas, I don't allow him to chase random felines, but he loves them too. When I adopted him, he was living with a cat who was bigger than he was. I wonder whether or not she gave him orders. He's become my constant companion. No matter how boring I get, even if I spend all day writing, he will hang out with me. In fact, he'll guard my laptop until I get back to it. Lots of dogs will sleep on your clothes, or your bed, but he's the first I've seen who's become attached to a piece of metal. On the brighter side, like many people, I'd really rather walk the dog than go to meetings. But there's a balance somewhere. Maybe you have to go to a whole lot of meetings before you appreciate what a luxury it is to walk the dog. Anyway, I hope my wife gets well soon, even if it means more meetings for me. The flu is terrible. I used to get the flu shot most years. Whenever I forgot, I got the flu. Ten years ago. I got the flu shot, and almost immediately thereafter was diagnosed with an oral cancer, which was no fun at all. Out of sheer superstition I haven't gotten another shot since. My wife, who is generally smarter than I am, got the shot this year, but also got the flu. Go figure. Toby is with her right now, urging her to stop being sick and to come play with him instead. He hasn't got a medical degree, but he knows what he likes.